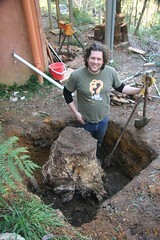 I have had many doubters about getting this stump out of the ground. It has taken a lot of digging, sawing and gritting of teeth but I've got it out!! Its an old hardwood tree stump that has been there since the house was built I guess but it was in the way of the water tank we want fitted. chain around car/motorbike? After hearing 'Darwin awards' stories of various deaths by 'car and chain...' i didn't think it was worth it. how are you going to get it out of the hole? Luckily we had two strapping lads staying with us who needed to test their manhood and help out an old fella. wow, I'm impressed! Would you like to pop over to our block one Sunday & do a couple more? Did you guys get our party invite for this Sat. ?